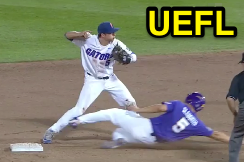 2B Umpire Steve Mattingly's interference double play call negated an LSU run during the NCAA College World Series' decisive game Tuesday night, as Mattingly ruled LSU baserunner Jake Slaughter—and his teammate, batter Michael Papierski—out on a violation of college's force play slide rule (FPSR). Umpire Mattingly explains his ruling. With none out and runners at the corners in the top of the 7th inning of a 2-1 ballgame, LSU batter Papierski attempted to tie the ballgame with a ground ball to Florida second baseman Deacon Liput, who threw to shortstop Dalton Guthrie at second base as Tigers baserunner R1 Slaughter slid in an attempt to break up the double play, Guthrie throwing onto Gators first baseman JJ Schwarz ahead of Papierski's arrival as baserunner R3 Josh Smith crossed home plate with the Tigers' apparent second run. 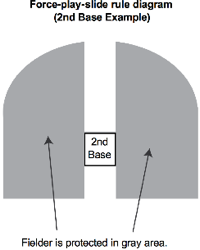 On any force play, the runner must slide on the ground before the base and in a direct line between the two bases...“Directly into a base” means the runner’s entire body (feet, legs, trunk and arms) must stay in a straight line between the bases....Exception—A runner need not slide directly into a base as long as the runner slides or runs in a direction away from the fielder to avoid making contact or altering the play of the fielder. Slaughter's slide is illegal in multiple ways. Additionally, amongst other restrictions, the runner's slide is illegal if, "The runner slashes or kicks the fielder with either leg." Note: High school rule NFHS 32-2-d uses this same language, but expands the scope to all slides, regardless of game situation: "A slide is illegal if—the runner slashes or kicks the fielder with either leg." NCAA Section 8-4 only pertains to force plays at any base. High school also calls runners out when, "on a force play, [the runner] does not slide in a direct line between the bases." (NFHS 8-4-2-b). In high school, "runners are never required to slide" (8-4-2-b-2), which is a rules difference from NCAA's "on any force play, the runner must slide..." rule 8-4. If the runner violates NCAA Rule 8-4, interference shall be called and the batter is out for the interference of his teammate. The ball is dead at the moment of interference, and all runners shall return to their previous bases (Penalty: "the batter-runner, as well as the interfering runner, shall be declared out and no other runner(s) shall advance"). Slaughter slid into FPSR's gray area. As demonstrated by the attached still image, taken from the third base grandstand, Slaughter appeared to kick Guthrie, and failed to slide directly into second base. If there is any lingering doubt as to whether Slaughter slid directly to the base, let the accompanying FPSR diagram put this debate to rest: the slide was illegal. Professional baseball's version of the FPSR is bona fide slide interference rule 6.01(j), which states, "If a runner does not engage in a bona fide slide, and initiates (or attempts to make) contact with the fielder for the purpose of breaking up a double play, he should be called for interference under this Rule 6.01." 4) Slides within reach without changing his path for the purpose of initiating contact with a fielder. The runner does not attempt to reach the base. Conclusion: Slaughter's slide is clearly illegal in both high school and college, which makes 2B Umpire Mattingly's call of interference the correct one. 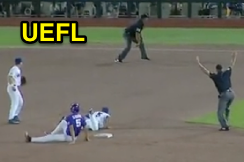 Unfortunately for LSU, due to the illegal actions of their baserunner, the runner from third base is prohibited from scoring on this play. Had this play occurred in Major League Baseball (or MiLB), Slaughter's slide would be deemed a violation of the bona fide slide interference rule because he failed to remain on the base after completing his slide (criterion #3). There is also a significant chance he failed to actually reach the base with his hand or foot (criterion #2). For more on OBR's Rule 6.01(j), visit our previous Bona Fide Slide posts. Video via "Read More"